SYKETTÄ Christmas bowling competition 1.-12.12. WHAT? 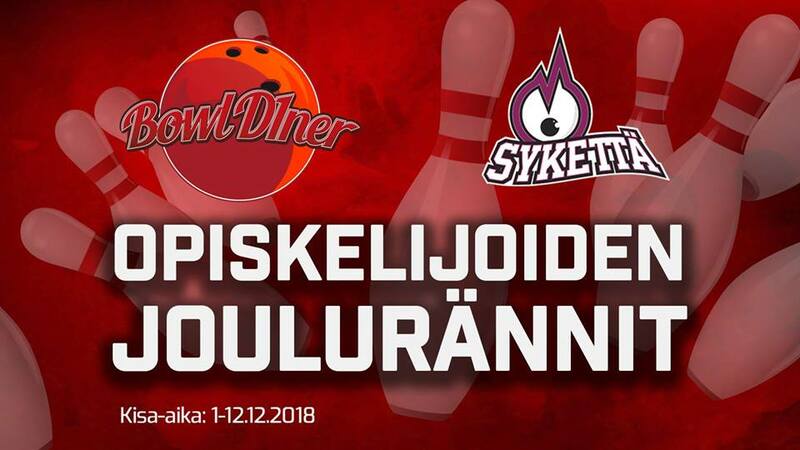 SYKETTÄ and bowling center BowlD1ner arrange a fun bowling competition for SYKETTÄ-users at the beginning of December. You can go to bowl in Bowld1ner any time you want, just tell at the service desk you want to join SYKETTÄ christmas bowling competition. You can bowl alone, with a friend or with a bigger team and as many times as you want during the competition time. You join the competition with your personal record. HOW? Pay the bowling normally and tell that you want to join the SYKETTÄ Christmas bowling competition. Show your SYKETTÄ-sticker at the info desk. You will get a scorecard. Please write down your own scores to that paper. Return your scorecard to the info desk after bowling. – Mon-Thu between 11.00 and 21.00, Fri-Sat11.00 -16.00 5€/person, includes bowling shoes.